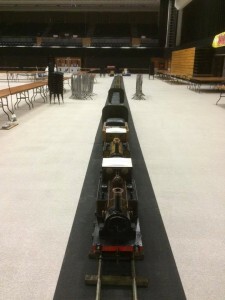 A very successful weekend was had at the Brighton Modelworld exhibition! We had many people making enquirers about our railway and we proved very popular with the public and 'Crowborough' (and 'Anna') were both kept busy shuttling up and down the track almost non stop for the three days. South Downs Light Railway Society shared the operational duties in the form of taking fares, issuing/checking of tickets, loading/unloading the trains. The takings are still being counted but early indications suggest that the portable railway has made more money than last years static exhibit brought in. 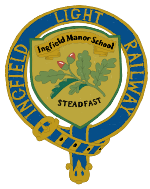 Once the show had shut at 5:00 arrangements were made for the packing up operation of the railway and transportation back to Ingfield. By 18:30 both locomotives, wagon and track panels were loaded onto two of our trailers and headed for home. Special thanks must go to all at SDLRS for their assistance, particularly Paul Cowlin & Jerry Chivers. Aidan Favell and Roy Harwood for their excellent coordination of packing up the display. Neal Catterall, Cameron Smith, Ben French and Callum Conway for operating the railway as well as packing up and of course to Chris English for making it all possible. See you again next year! Here is a list of 2016 Open Days at Ingfield Light Railway. Thursday 31st March - Easter Egg Hunt, in aid of The Dame Vera Lynn Trust Sunday 24th April Sunday 15th May has been changed to Sunday 22nd May Sunday 12th June - Fete Day, in aid of Friends of Ingfield Sunday 17th July More running days to follow. Details will be posted as they become available. Article from Fusion Magazine about Ashford Family and Friends Open Day. Change of date for the next public running day. Running day on April 24th!